Eventually, a deal has been made on the spirit of national unity and INCLUSIVE POLITICS in Cambodia. 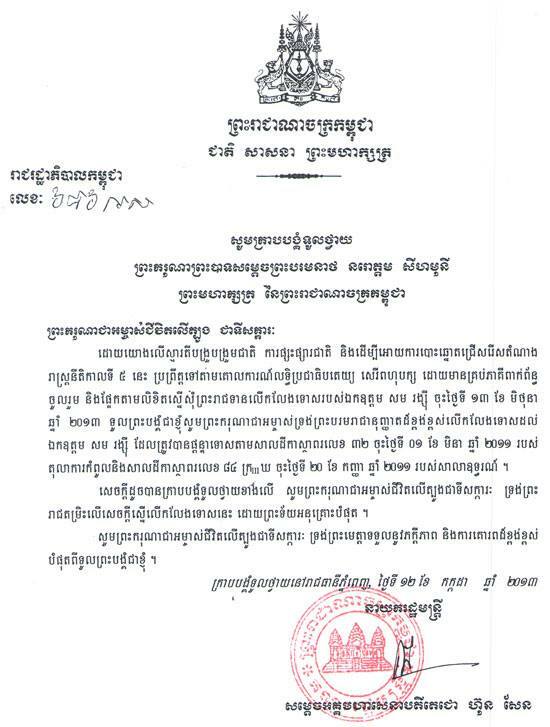 In the same day of pardoning letter requested by the Prime Minister, the King signed a pardon on July 12, 2103 to ensure safe return of prominent opposition leader, H.E. 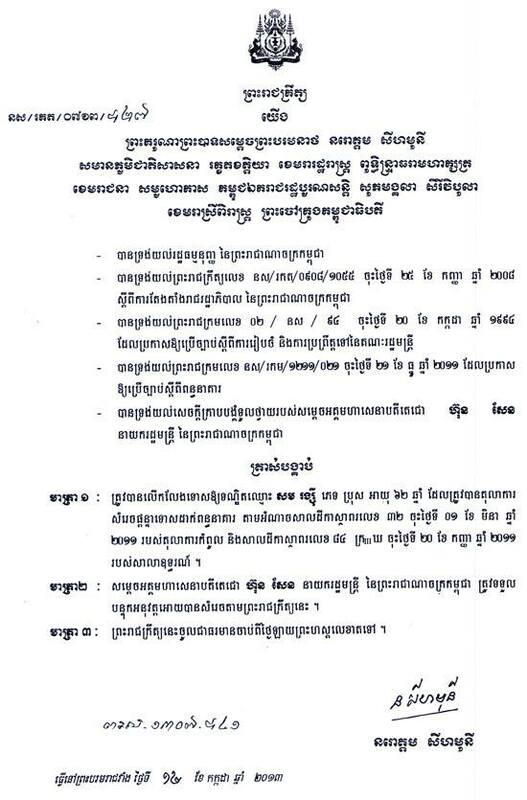 Sam Rainsy, president of the largest opposition party: Cambodia National Rescue Party (CNRP) to his political career. Needless to say on the inquiry of both Cambodians and national communities, the presence of H.E.Sam Rainsy in Cambodia is imperative for fair and free election of this upcoming national election July 28, 2013. But his just return is meaningless to this NATIONAL ELECTION if he is not included into the voting list and electoral candidate. Inclusive politics would be the feasibility of including H.E.Sam Rainsy into the voting list and eligibility of running an electoral candidate within this time constraint. National unity means inclusion. Exclusion is not an element for any unity process. Putting the interests of the nation first is the soundest scenario and it challenges the behavior of greed, nepotism and fear. 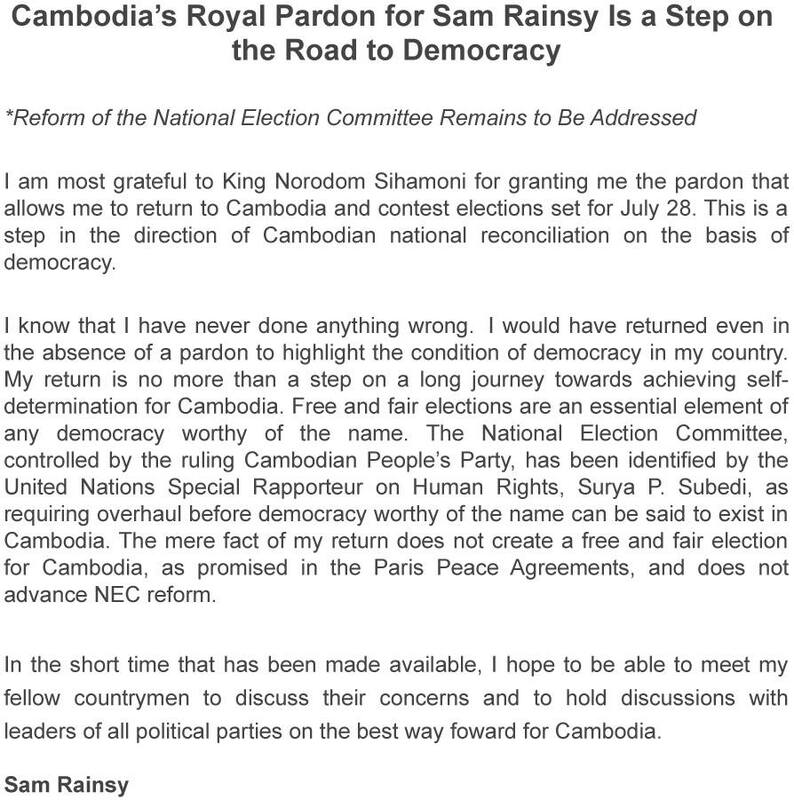 National Election Committee (NEC) will be the important player to ensure that Cambodia is heading towards the INCLUSIVE UNITY by ensuring fair and free election to including H.E.Sam Rainsy into the electoral candidate at this time.